We started our Thanksgiving day with traditional mimosas. The kids were big helpers in the kitchen! They had so much fun cooking with us. I did what I normally do each Thanksgiving. I eat at least 3 or 4 plates of food. I love to put the food away on my favorite holiday. It's the one day I really eat a ton of food! We had a fun day celebrating and watching football. I love my family! We are blessed! The kids had the best time playing in the snow today. Lily was so funny. She was running and chasing the kids. They were laughing and giggling and Lily was barking at them. It was so funny to see her little personality shine when she was playing with the kids. She's a great pup and she really is a good companion to the kiddos. I'm glad the kids got some energy out. They needed to run and play. I have to be honest, I barely stepped out of the house because it was too cold for me. I'm glad they had fun though!! We had the best time watching football yesterday with our buddies. It was a fun day of first watching the Ohio State game and then finally watching the Baylor game. I have found a really great group of ladies to hang out with. We always have fun and our kids and husbands have fun together too. We all love food and football! We may not like the same teams, but we sure do have fun giving each other crap about who wins and loses. It's all in good fun and I'm thankful for these friends who are so much like family to me! I have a short walk to school with the kids every morning. We are lucky to live very close to the school. Every morning on the walk back home I take in the every single bit of the scenery. Mornings are crazy in our house. Kids are getting ready, eating, brushing teeth, scrambling for book bags and putting on our winter gear. Putting on the gear adds five extra minutes to the morning routine. Heck, sometimes ten extra minutes. Sooooo when I walk home kid free I enjoy the quiet walk home before I beging my day of chores. 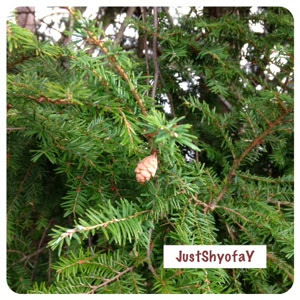 Today I saw this cute little baby pine cone. I can't wait to watch it grow every few weeks. I feel like we are so busy and sometimes I don't stop to enjoy the little things. I have a goal to be more present in the weeks to come, even with the chaos that the holidays bring. This little pine cone is going to keep me grounded. Every day I see it will be my reminder! When I was a little girl I was a huge Texas Longhorn fan. I wanted to go to The University of Texas at Austin my whole life. I don't even really know why, but I was a little girl and thought that was the school for me. My daddy is a Texas Tech fan and I knew I'd never move that far away from my family. Ha! I never considered Baylor because it was so expensive and Waco was too close to home. Oh the thoughts of a teenager. All that to say: I met Gary while he was attending Baylor and I became a Baylor fan to support him. So, since approximately 1997 when Gary and I started dating I transformed into a Baylor Bear fan. It took years and lots of rivalry, but since I never attended UT it wasn't ingrained in me to stick with loving that team. The kids are now Baylor fans obviously because we are. Hayden thinks it's pretty cool that his daddy was on the Baylor football team, even if it was for a short time. This year Baylor football is having an amazing year and it is so fun to watch the games with our buddies here in Ohio. Every week when the rankings are posted we all look forward to seeing how our teams are doing. We have some really great friends who cheer for Ohio State. We also have some friends who cheer for the West Virginia Mountaineers. It has been a fun football season to say the least. We're all looking forward to the weeks to come!! We woke up to fresh snow this morning! I can't believe it snowed. The kids were thrilled. They were a tad upset they couldn't play it in because school was not cancelled. Hayden wanted to throw snowballs and Layla wanted to make snow angels. I reminded them that we aren't in Texas any longer and that it will snow again I'm sure! Yay for more snow! Temps are swooping down getting cooler and that means time for the first batch of chili for the season! Hope you've had a great three day weekend! We have! Do you ever get sucked into pinterest? I love pinterest quotes. They make me happy. When I find myself in a stressful situation I turn to reading, even if that reading is as silly as pinterest. It makes me feel refreshed and revived. I won't post a ton about my personal feelings for now, but I will say moving from a big city to a small town is very different socially, as you can imagine. It is exactly the town in which I want to raise my kids, but it is most certainly different than Fort Worth in the drama department ... if you know what I mean. All the experiences we encounter make us stronger. They also make my children stronger because we all learn how to deal with personalities different from ours. In closing, even if we as individuals feel scared or week or bullied at school, we come home to our safe place and bond as a family. Our family unit is all that matters in the end. We are obsessed with fall. I hate to keep saying it, but I'm loving the beauty of the fall leaves. I wish they would stay on the trees longer .... It's simply gorgeous! And some of the leaves are ginormous!